This article is about the Mesoamerican corn-based food and drink. For the Andean barley-based drink, see Pinol. Pinole, also called pinol or pinolillo, is roasted ground maize, which is then mixed with a combination of cocoa, agave, cinnamon, chia seeds, vanilla, or other spices. The resulting powder is then used as a nutrient-dense ingredient to make different foods, such as cereals, baked goods, tortillas, and beverages. The name comes from the Nahuatl word pinolli, meaning cornmeal. Today, pinole is generally made by hand using wood-burning adobe ovens and a stone and pestle, and is still consumed in certain, often rural, parts of Latin America. 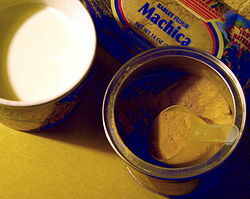 In fact, pinole is considered the national beverage of Nicaragua and Honduras. Depending on the type of pinole and the quality of its ingredients, pinole can be high in key vitamins and nutrients, including protein, amino acids, fiber, and antioxidants. Due to the large amount of fiber and the slow digestion of the maize, pinole also has a very high satiety effect, leaving those who consume it feeling full for a longer period of time. For many indigenous peoples of Mexico and Central America, it is relied upon as a key source of nutrition and sustenance. Along with chia, pinole is a staple food of the Tarahumara Indians. The Tarahumara are a reclusive indigenous people who live in the Copper Canyon of Mexico and have been called "The Running People" due to their remarkable health and ability to run hundreds of miles without rest, typically barefoot or wearing only thin sandals. The Tarahumara usually consume pinole as a food/snack and use it as fuel for their runs. The Tarahumara and pinole were featured in the New York Times Bestselling book Born to Run: A Hidden Tribe, Superathletes, and the Greatest Race the World Has Never Seen (2009) by Christopher McDougall, which is scheduled to be made into a film starring Matthew McConaughey. The recorded history of Pinole, California dates back to the early 1700s when a Spanish commandant, Don Pedro Fages, led an exploration through the Contra Costa shoreline of California. With a small band of soldiers and an Indian guide, Don Pedro Fages left Monterey and traveled northward until he reached the area known today as Pinole. According to legend, the soldiers ran out of provisions on their march and found a village of Indians who gave them food. This food consisted of a form of meal, made from acorns, seeds, and wild grain, which they called “pinole” (derived from the Aztec word “pinolli” meaning ground and toasted grain or seeds.) Thus, the soldiers named their camp “El Pinole,” and Pinole received its name. In parts of central Mexico, groups of rowdy youths traditionally went from house to house during Carnival to demand pinole, which they were served without water (and frequently mixed with chili pepper to make it even more difficult to swallow). This custom may have given rise to the popular saying, El que tiene más saliva, traga más pinole ("Whoever has the most saliva, swallows the most pinole"; in other words, whoever has the most skill for a particular job will accomplish the most). Authentic pinole can occasionally be found in rural markets throughout Mexico and Central America. It is generally made by hand and sold as a powder in burlap pouches. A sugar-heavy, mass-market version can also sometimes be found in Latin American supermarkets under brands such as Don Julio. ^ "The No Meat Athlete". Nomeatathlete.com. ^ "Benefits of Pinole". Livestrong Foundation. 2015. Retrieved 1 June 2015. ^ "What is Pinole". Wisegeek.com. 2015. Retrieved 1 June 2015. ^ "Born to Run Book Review". The Washington Post. 2009. Retrieved 1 June 2015. ^ "Born to Run". Born to Run. 2015. Retrieved 1 June 2015. ^ McDougall, Christopher (2001). Born to Run. ^ "Born to Run Blog". Born to Run. 2015. Retrieved 1 June 2015. ^ Child, Ben (29 January 2015). "Matthew McConaughey born to run in upcoming Native American drama". The Guardian. Retrieved 29 May 2018. ^ a b c d e "History of Pinole". City of Pinole. 10 September 2015. Retrieved 10 September 2015. Francisco J. Santamaría, Diccionario de mejicanismos, Mexico City: Editorial Porrúa, 1959, 1978. This page was last edited on 2 April 2019, at 14:37 (UTC).